Why would a business enroll in the GSA Program (GSAP) over getting regular GSA registration? Getting on a GSA schedule is a big deal. It's a lot of time and resources for a potentially huge payout. Even the GSA estimates that businesses can spend from $80,000 to $130,000 just to get on the schedule. This is an opportunity that you cannot afford to lose. That's why US Federal Contractor Registration developed the GSAP. When you get on a GSA schedule, you're on there for 20 years...if everything goes smoothly. In your first two years, you are required to make at least $25,000 in sales through the schedule. If you don't, then you're out. "How is that? Isn't a GSA schedule a ticket to making crazy sales with little effort?" Essentially, a GSA schedule is like online shopping for the U.S. government. And yes, there are cases in which Uncle Sam loves a product or service so much, that a company's sales blow up once they get on the schedule. That is the reality for a few, but not for most businesses. You need to put in some extra effort to keep your GSA schedule. 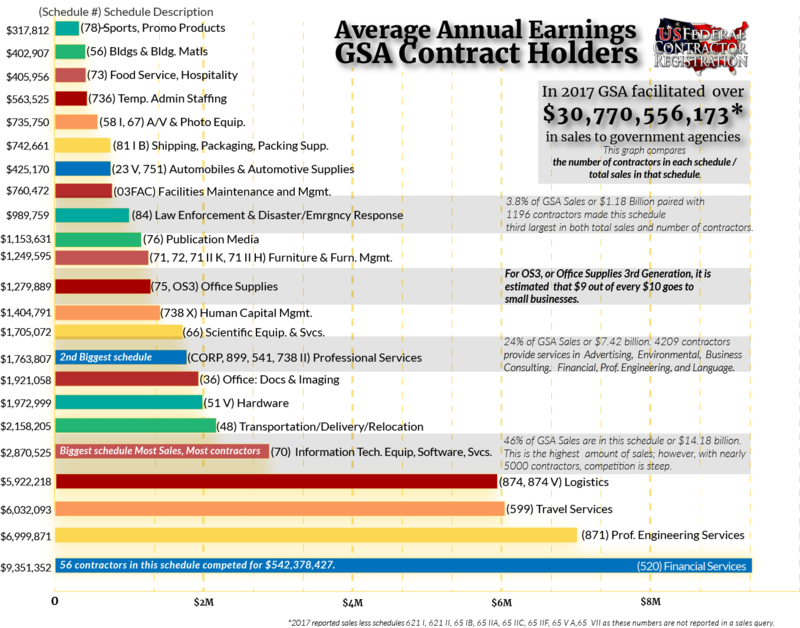 With a GSA schedule, there's so much to gain for your business as a whole. If you don't reach those goals of $25,000 per year, all that time and effort was for nothing. You could be in an even worse position than before you started. Here is how USFCR's GSAP sets you up and keeps you on the schedule. Time is money. That estimate of $80,000 to $130,000 comes from the value of the time consumed to set up a GSA registration. Don't let this registration take you away from your business. USFCR has the experts to take care of it for you. They've handled hundreds of these registrations and it's guaranteed to get completed. Many business owners don't even finish their GSA registration because of how costly, complex, and frustrating the process can be. You will not be one of them. When you're enrolled in the GSAP, we will evaluate your prospects in the federal market. Who are your competitors? How much are they making from their schedules? What works for them and how can you apply it to your own business? Getting the answers to these questions can significantly boost your overall sales in government contracting. You will also have access to our learning resources. Instead of sifting through the web for information on GSA schedules and federal procurement, you'll have it in one spot and it's broken down to you in plain English. Knowledge is power. Next, we'll set up a proven b2g marketing plan for your business. This is one of the most crucial steps in this process. They're all pretty important, but this one can really put you ahead of your competitors. Having marketing efforts directed toward the government shows that you are dedicated to this type of work. Its that first brick laid down to form that foundation of trust and familiarity. It makes you visible to the government and builds a bridge to your business. Call: 877-252-2700 ext 1. to speak with an Acquisition Specialist.